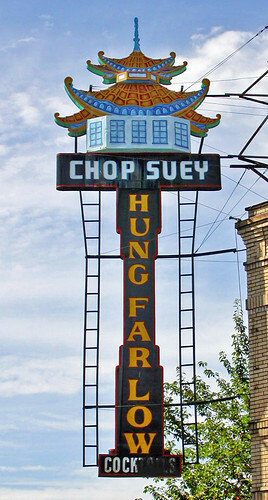 I remember eating at Hung Far Low's. It was one of the best Chinese places down there, when that was THE place to have Chinese food. Hilarious that they are working to bring back the sign, a landmark much more eye catching than the leaping reindeer, in my opinion. Yes! And likely to attract a very different kind of tourism. As someone else here commented, that sign has a kind of cheerful bad taste. It will offset the unbearably gentrified air of the Pearl quite nicely, I think.